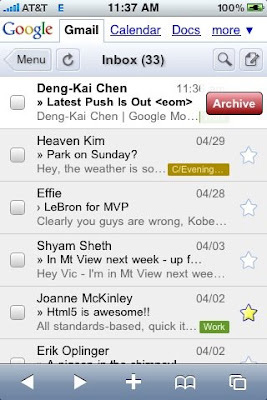 On April 7th, we announced a new version of Gmail for mobile for iPhone and Android-powered devices. Among the improvements was a complete redesign of the web application's underlying code which allows us to more rapidly develop and release new features that users have been asking for, as explained in our first post. We'd like to introduce The Iterative Webapp, a series where we will continue to release features for Gmail for mobile. Today: Swipe-to-archive and expanded English language support. --Shyam Sheth, Product Manager, Google Mobile. When we first released the new Gmail for mobile web app, we designed the floaty bar to make it easy to quickly manage your inbox and take action on multiple emails at once. However, we wanted to make it even easier to perform one of the most common actions: archiving. After reading the subject of an email and the first line of the message, I often know if I don't need to open the email to read the rest. With swipe-to-archive, I can simply swipe my finger across the email in the inbox, either from left-to-right or right-to-left, and then tap on the red 'Archive' button when it appears. Please note, this feature is only available for the iPhone. We've also expanded the availability of the new Gmail for mobile app to English users in the United Kingdom as well as India. To try out swipe-to-archive and Gmail for mobile, visit gmail.com in your device's browser. To easily access your Gmail account, try creating a home screen link. Nice feature. Thanks. Is there a place where I can suggest new features or browse existing suggestions? Why not just 'swipe to archive' instead of 'swipe to bring up a button to press to archive'? The second step is unnecessary. And i'll add the obligatory "Why not for android?" question. So... more importantly, when will Latitude be available for iPhone? That's neat, but where is push email for iphone? Why would you develop this for the iphone and not for peole who have bought the google phones? That seems a slap in the face to your customers. Why don't I get the google-logo and tabs for calendar, docs etc? Swipe to archive works great, but I would like the tabs too! Great. Can you fix the "X" that appears in place of images when viewing Gmail on iPhone's Safari browser? Why not use the iPhone mail app? Than you van add push mail! We are waiting allready 2 one year please add push email!!!!! re: Why not use the iPhone mail app? I was going to post with a crybaby comment about why not for android, but the I realized that at least I don't have to open up an app to see if I have any new mail. Swipe to activate a control is an iPhone standard, it keeps you for inadvertently doing something in this case archiving, in other apps deleting. The love for the iPhone web app is good, more power to you. But how about some long over due love for the regular old web app? How about dragging and dropping mail to labels? How about a contacts app that does not make my eyes hurt to look at it? How about integration with the Windows and Mac desktops? When will we see parity for webOS? And is there a place to report bugs w/ Google Mobile sites on webOS? Errm... Swipe-to-Archive JUST on iPhone? So... does this mean I should have bought an iPhone instead of my perfect HTC Magic WITH Google? The link no longer shows the Gmail icon on the iPhone. The older version still does. I appreciate you guy's diligence on working on this but the fact of the matter is we need push to make gmail a worthwhile service with iPhone. Particularly now that 3.0 launched and it has server search (which is quick and extremely useful) I no longer use your web app, and have no reason to go back. For me, the only advantage of the web app is threaded email view but the offline unavailability and lack of push make it unusable. Please get push to work on this phone soon. I think it's disappointing that a service like Yahoo can do it but you cannot. I am excited by the various new gmail features, but frustrated that none of it is being allowed to work on capable browsers like opera mobile and other browsers running on capable phones like htc touch pro. I am an avid gmail user. allowing these features to be web based but only work on certain phones seems to defeat the purpose of google's cloud/any-platform approach that attracted me. I got a Nokia N810 and when I use the web browswer included in that gadget (MicroB browser) using the user agent the iPhone browser uses It works really well, but when I change the user agent to the original one supplied by my browser the Gmail web-app got an anoying bug which keeps returning the page to the top, even If when I try my best to get to the bottom of it. I understand the MicroB browser isn't supported, but when the problem disapears just by changing the user agent, I think is just such an small problem that can be solved really easy. I don't get it. I use iPhone mail for .mac, gmail, yahoo, Comcast & ATT. Msgs get pushed fine. In fact my iPhone always beeps for incomming mail before my desktop. Nice feature, but I like the suggestion for swipe to delete, that would be cool. Although, I am not using this much since the images in my e-mail still come up with those question mark symbols, any resolution coming there? I wonder if we will ever see Latitude on iPhone since it seems like a free version of the "Find my iPhone" feature of MobileMe and 3.0. It does not have the functionality of the remote wipe or the paging, so there still is hope. I'm with dwfrank. Current Gmail web client implementation on WebOS is terrible. Is there a plan for better support? Is there a place to report bugs? WebOS capabilities are, but support fro Google Mobile is so far non-existent.